I am currently reviewing a manuscript without line numbers. Arrrrrrggggh. It is hard to refer to a particular word or sentence when you cannot refer to line numbers. Instead of writing Typo in L13, “Eschericia”, now I need to write “At the beginning of the second paragraph on P4, typo…”. If you make a lot of comments, like I usually do, this becomes a bit of a pain. And it is especially hard in manuscripts that have long paragraphs that span over multiple pages. Line numbers are so easy to add to documents, why didn’t the authors bother to do that? Why don’t Editors make it an absolute requirement of the manuscript? Today, I started the review of one of those manuscripts, and bummer, no line numbers. I just added my own numbers using Excel, and let the authors figure it out. As revenge. Hehehe. I usually just quote enough text to uniquely identify a chunk of content, or use a coordinate system of page:paragraph:sentence. 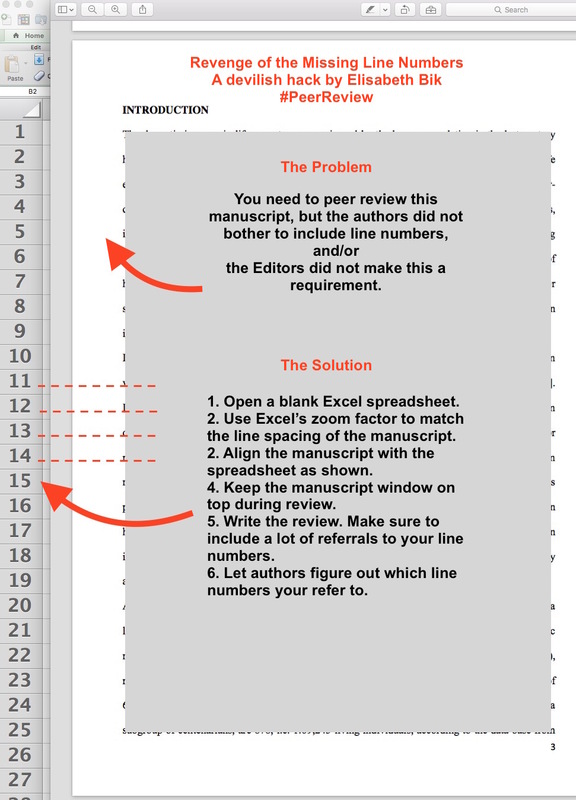 Do people ever review using comments in a PDF document?